With Nikon and Canon having recently launched brand new mirrorless system mounts and talking about their benefits, there seems to be quite a bit of confusion among photographers in regards to camera lens mounts. This is especially true for things like “throat size” and “inner diameter”, where different measurements are used to wrongly quantify a mount’s potential. Unfortunately, there is a lot of misinformation out there regarding mounts and their exact sizes, which is why I decided to write a detailed article talking about different mounts, their differences and take more precise measurements for different systems to present accurate information. 1. 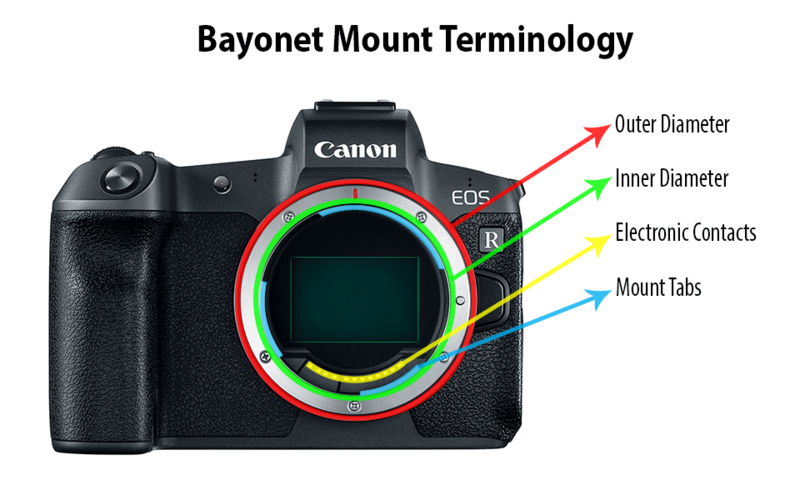 What is a Lens Mount? Simply put, a lens mount is an opening of a specific size on an interchangeable lens camera that allows attaching lenses designed for that mount. Although in the early days of photography lenses were only mechanically attached to cameras without any communication between the two, with the rise of automatic metering and autofocus systems, it was necessary to create electronic contacts on both cameras and lenses to allow them to communicate with each other. As a result, a lens mount became more than just a physical hole, but more like an interface between lenses and cameras. Today, practically every lens mount for photography is a bayonet mount (the name “bayonet” comes from the type of fitting soldiers used on their rifles to quickly mount bayonets), where three to four tabs are used to lock a lens tightly in place, but other lens attachment systems have been used in the past, such as screw-threaded lock and breech-lock. With a bayonet mount, one aligns a marked section of a lens (typically a colored dot) with the marked section on a camera body, then after coupling the two, twists the lens either in clockwise or counter-clockwise direction (depending on the brand / mount) until it locks into place. The locking mechanism is mechanical, with a spring-loaded pin locking the lens in place in its proper position, requiring the pin to be retracted when a lens needs to be detached (which is done using a button next to the camera mount). The bayonet mount has a number of advantages compared to other mounts, which is why they are the most popular today. First, it makes it quick and easy to attach and detach lenses. Second, it allows for a tight and precise fit, which is especially important when shooting with modern high resolution cameras, as any sort of wobble or play could end up negatively affecting parts of the image. And lastly, a bayonet mount also allows for easy incorporation of electronic contacts between lenses and cameras to enable the two-way communication. Due to the proprietary nature of all camera mounts, each one of them can differ in mounting direction, mount size, flange distance, number of electronic contacts and even where the electronic contacts are physically placed. Let’s take a look at each in more detail. While most lens mounts require attaching lenses by twisting them clockwise, some brands like Nikon have a reversed way of doing it. On one hand, it does not matter which direction a lens is mounted or dismounted, but on the other hand, it might cause some confusion and might take time to get used to it, especially for those who decide to switch brands. Below is a table that summarizes the mounting direction of lenses among the popular camera brands. Please note that the mounting direction is relative to the front view of the camera. 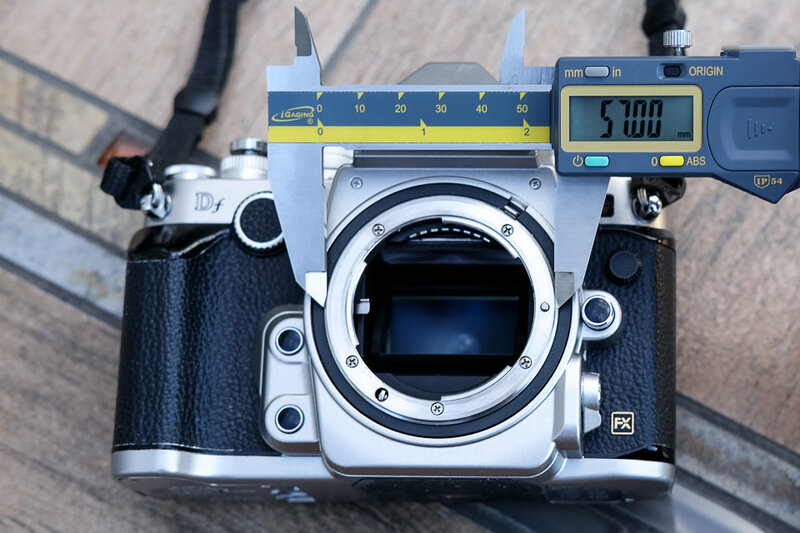 When it comes to mount size, there are a few important measurements that need to be done correctly, especially when a lens mount is being compared to another one (as you want to compare apples to apples). There is throat size, inner diameter and outer diameter, and all of them mean different things. Let’s take a look at different measurement criteria and their differences. The throat size of a lens mount is the inner diameter of a mount, minus the tabs that are used to mount lenses. Throat size gives us a more accurate representation of the potential of the mount and is important for calculating the angle of incidence, which we will discuss below. As you can see, the distance measured is between the two tabs on the inner side of the mount. The inner diameter of a lens mount represents the size of the lens opening ignoring the tabs on the mount. This measurement is often provided by camera manufacturers to give us an idea of the overall size of the lens mount. Please note that the measurement is taken of the outermost inner part of the mount here. 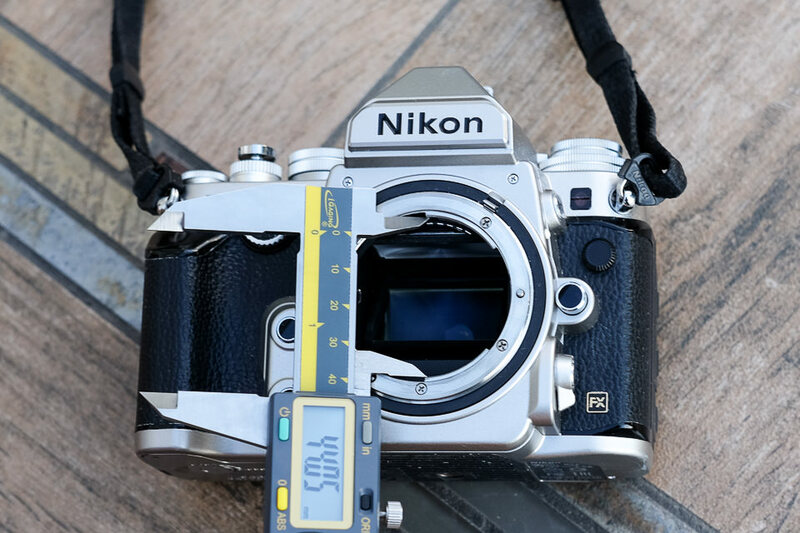 Due to the small additional recess within the inner mount in the case of Nikon F, there is an additional loss of 0.5mm to clear it. Hence, while the inner diameter is 47mm as measured above, it is technically 46.5mm between the inner parts of the mount. The outer diameter of a lens mount is the full diameter of the bayonet mount, which in most cameras represents the end of the metal mount. The outer diameter of the mount plays an important role in determining the approximate outer diameter of the rear part of a lens, as it must be able to wrap itself over the outer diameter. Again, there is another small recess that is right below the outer part of the mount, but we do not measure the outer diameter from it. Flange distance, also known as “flange focal distance”, “flange back distance” or simply “register”, is the distance between the mounting flange (which is the outer part of the lens mount when viewed from the side) and the film / sensor plane. Just like different mounts have differences in throat size, inner and outer diameters, flange distances also often vary greatly between different camera systems. Now that we have defined the mount size and the flange distance, let’s talk about the pros and cons of large vs small mount sizes, as well as the impact of the flange distance on a system. The size of the mount is an important factor in a camera system. Generally, a larger mount size allows for larger lenses that can provide more light to the sensor. Hence, faster lenses can be designed by optical engineers. At the same time, mount diameter is not the only variable that impacts lens design – flange distance is also equally important. Shorter flange distance allows lenses to be placed closer to the sensor, which in itself allows lens manufacturers to start building simpler, smaller, lighter and less expensive short focus lenses instead of the retrofocus types. 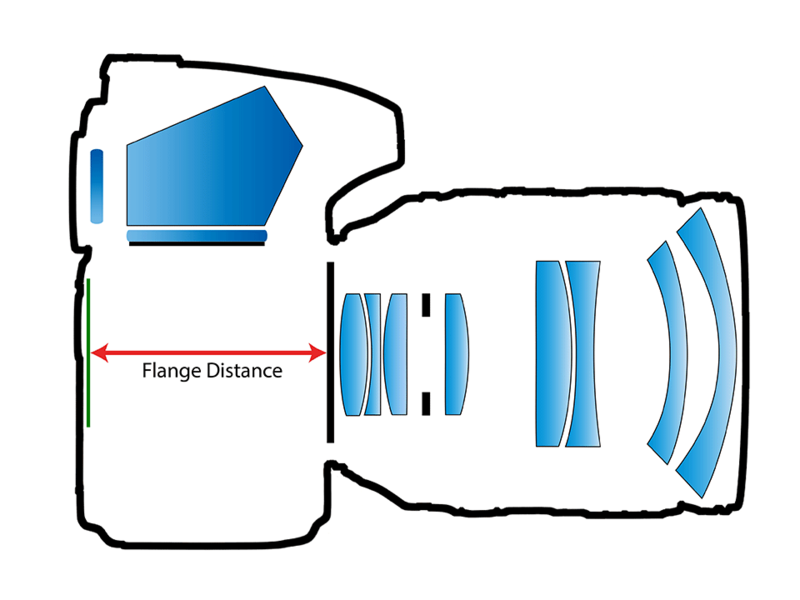 A shorter flange distance also allows to design thinner cameras, thus making them smaller and lighter compared to cameras with longer flange distances. In addition, it allows lens designers to place a more powerful actuator on lenses for faster autofocusing, and makes it possible to adapt lenses from other camera systems with longer flange distances via adapters. Lastly, the throat diameter combined with flange distance determines the maximum possible angle of incidence of the marginal rays from the lens, which is important in designing lenses – generally, the larger the angle of incidence, the easier it is to make high-performance lenses. One downside of a larger lens mount is lens size and weight issues. The larger the throat diameter, the larger the lens has to be at its mount point, which obviously does impact its overall thickness and weight as well. Also, the shorter flange distance can lead to increased vignetting or discoloration in the corners of an image (although this can be mitigated by making the lens design longer to simulate a longer flange distance), due to sensor microlenses not being able to pass enough light at extreme ray angles. When adapting lenses from other mounts, it is important to point out that due to the proprietary nature of autofocus systems, differences in exchange of information between camera body and lens via electronic contacts (the number of which also vary from system to system) and other issues, most adapters end up being “dumb” adapters with manual controls, manufactured by third party companies. Camera manufacturers themselves often provide adapters with the release of shorter flange distance systems to be able to mount lenses from other camera mounts that they developed in the past, but they almost never provide adapters for competing systems. In addition, some adapters are capable of changing the physical properties of lenses by using glass elements in them, while others make it possible to insert a lens filter (such as neutral density or polarizing filter), making it possible to use filters on wide-angle lenses with oversized front elements, without involving bulky filter mounting rigs and large filters. When adapting lenses from other systems, it is important to make sure that the target lens mount has a longer flange distance in order to be able to achieve infinity focus. Furthermore, the difference in flange distance between the source and the target system has to be big enough to have enough room for an adapter to sit between the lens and the camera for a dumb adapter. Smart adapters that can establish communication between the camera and the adapted lens must have even more legroom for contacts and electronics to fit between the two. To find angle of incidence, I calculated the angle between the throat diameter and the top center of each system’s camera sensor. I assumed all full-frame sensors to be 24mm in height, the Fuji X camera sensor to be 15.6mm in height, and the Fuji G camera sensor to be 32.9mm in height (note that other websites sometimes do this calculation with inner mount diameter rather than the throat diameter, and they may calculate from a corner or the center of the camera sensor rather than the top center). Please note that the above information is based on my research and submitted data from our readers. If you use a system that is not listed in the table and would like to help expand it with more data, please use the images in this article to properly measure the lens mount, then provide the information in the comments section below. We will do our best to update the table as soon as possible! Useful deep dive into the technical advantages of mirrorless. Looks like Z-Mount may have an edge here, and time will tell as the lens systems develop. Thanks Barron! Yes, Nikon Z has the biggest potential in terms of its mount when it comes to designing lenses. My doctor keeps insisting that it’s not. it depends where the girth is doesnt it? Unfortunately not. Sony missed a trick with E-mount. Now they are stuck with a serious disadvantage vis-à-vis their main competitors, Nikon and Canon. Could I suggest that two more important dimensions be included, the most important dimensions for the lens are the inner diameter of the lens tube oriface inside the lens mount typically 2-3mm smaller than the throat diameter,and secondly the lens mount protrudes into the camera body mount by around 5-6mm. in the case of the Sony mount this reduces the orifice through which the light rays emerge to around 40mm but 10mm off the surface of the sensor resulting in a greater chance of vingnetting with some lenses, and restrictions in the size and or positioning of rear elements. The oriface is not the rear elements, but what thy are fitted into these can be any distance from the sensor. The Z mount because of its larger size does not have a problem here, the oriface is so much larger than the sensor that it cannot vingnette at the closer registration distance to the sensor, caused by the mount mechanism of the lens itself. Mike, I would love to include this data, but I have no means to measure it for the above mounts. I have a Nikon F, Fuji X and Fuji GF cameras to measure, but everything else has to come from someone else. Also, I need to make sure that everything is measured with high precision – are you sure that it will be possible to do that with all mounts including Sony? The trick is to find a dumb adaptor for the mount you wish to dimension. there are no contacts, elements or other items in the oriface to get in the way of measuring the inner diameter, this is is the max diameter lens designers have available to work their magic. For the Sony E mount this was 41.7mm. Take a measurement of the overall length of the adaptor, and a second measurement over the two mounting faces of the adaptor, take this away from the first measurement and you are left with the dimension of how far the mount of the lens protrudes into the body. For the Sony Emount I get 5.6mm making the dimension from the rear of the lens orifice to the sensor 10.4mm. This is a really well written article which gathers about all important information about lens mounts. Thank you, Nasim. May I suggest a next article of such kind about AF-systems (auto focus systems, i.e. phase detection systems)? It could address the correlations between aperture, blur of wide open lenses vs resolution of the single AF cell, the difficulties of a short flange range and so on which all lead to physical limitations (no 58mm f/.95 Noct with AF from Nikon). I read your articles “Autofocus Modes Explained” and “How Phase Detection Autofocus Works”. I also read some other (even technical) articles on the web. There are several contradictory statements and explanations or the articles are either too simple or too sophisticated. Would love to read about it as I did while reading this one. These means that Fuji X mount would be able to support an FX sensor with better optical quality than Leica system, isn’t it? The throat diameter is only big enough to cover an APS-C sensor. But Leica M is full frame and has a smaller throat size than Fuji X. Perhaps flange distance is also relevant here thuogh. Even though I am a Nikon user, I do also very much like Fuji for its combination of portability and high image quality (sensor and lenses) although getting the best RAW conversion and sharpening was a bit of a pain.. I was going to upgrade my Fuji XE-2 to XH-1 to take advantage of IBIS and a somewhat larger sensor, but now the Z series is out that doesn’t look so sensible any more. The Z7 has a huge sensor, IBIS and is, if anything slightly smaller than the Fuji. Also RAW conversion is straightforward. There is the matter of cost of course but barring that, it looks to me like Fuji may start to suffer now? I find this extremely confusing with regard to computation of angle of incidence. The method described gives the angle of a line from the top of the throat to the top center of the sensor. It is the deviation from vertical with respect to the sensor plane. I’ve checked this with the Nikon F and Z data given — tan-1 (10/46.5) = 12.14, and tan-1 (14/16) = 41.19, respectively. Smaller angles by this calculation mean CLOSER TO VERTICAL. Assuming that vertical incidence on the sensor is better, Nikon Z turns out to be the WORST camera by this metric. Surely something is wrong here. The angle of incidence is the angle at which light strikes the sensor, not the deviation from the vertical. “In geometric optics, the angle of incidence is the angle between a ray incident on a surface and the line perpendicular to the surface at the point of incidence, called the normal. ” (from en.wikipedia.org/wiki/…e_(optics)) To repeat myself, the metric used in this article would lead us to believe that the light rays impinging on a full-frame F-mount sensor will be closer to vertical — a desirable thing — than light rays impinging on a Z-mount sensor. I think that any meaningful discussion of the benefits of Z vs. F mount must include some reference to exit pupil size and distance with respect to throat size and flange distance. This discussion here – www.dpreview.com/forum…t/61552323 – helps, I think, but still leaves some issues unanswered. Phil, I would recommend to watch the video by Nikon to understand why you are wrong in your assumption that the vertical incidence on the sensor is better – no, it is the other way around. A larger mount with a shorter flange distance allows for steeper angles, which allows lens manufacturers to make shorter, lighter and sharper lenses compared to smaller mounts. 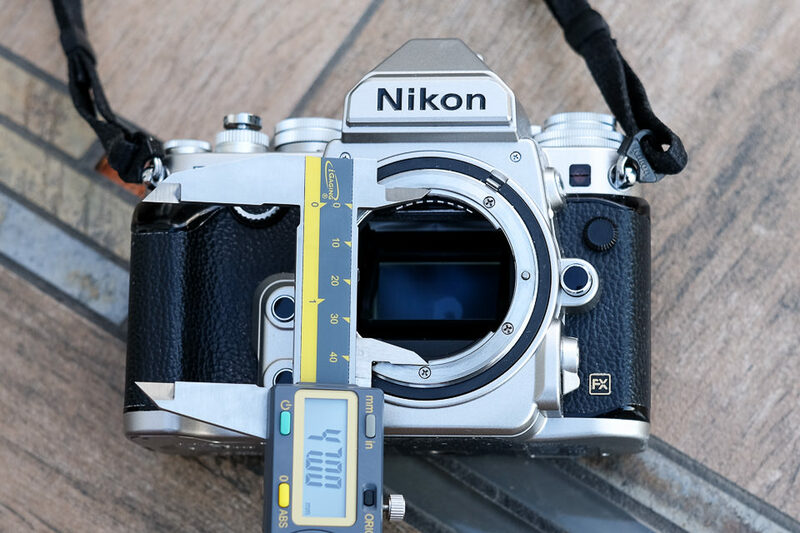 In this case, 41.19 degrees on the Z is far better than 12.14 on Nikon F (and this is also why the Nikon F is much more limited compared to Nikon Z). Imagine what an f/0.95 lens would look like for the Nikon F – it would probably be twice the size of the Nikon Z 58mm f/0.95 that is currently in development, making it extremely costly and impractical. Extreme ray angles do make it difficult for the sensor to get all light at the edges of the frame, but manufacturers find ways to get around that by tilting microlenses. I wonder what this means for Nikon DX mirrorless, which presumably will come. I would think the goal here should be weight and portability, with F mount compatibility. I wonder whether this could imply a compact body with F mount size throat, short flange size and two converters. One converter would be for F mount and the other for a new mount smaller than F mount, perhaps with the outer diameter smaller than F mount throat size, to allow for slow but very small and light lenses, especially primes. Murray, we don’t know what Nikon is planning for Nikon DX mirrorless, so it is all a speculation right now. If Nikon went with a different mount, it would be a huge mistake – same issue Canon is running into right now with their mirrorless APS-C. Nikon DX mirrorless should either be F-mount (not practical due to long flange distance), or Z-mount. I suspect it will be Z-mount, but with smaller lenses. Nikon has historically been very bad with DX lens line-up and if we ever see a mirrorless DX, it will probably be a disappointment again, with plenty of 18-55mm, 18-200mm and 70-300mm zoom lens options and very few high quality primes. Some reviewers of the Z-series claim that their is a visual different of similar apertures with regards to the Z-mount versus other, older mounts. I.e. f/4 on Nikon Z behaves closer to f/2.8 due to the increased light potential. I don’t see how that’s possible, but I did read it. Is there any truth to that? Barron, an f/4 lens is an f/4 lens no matter what goes behind it. If I understood correctly that assertion, the benefit is not in terms of light-gathering but edge-to-edge sharpness. An f/4 Z-lens will give you the same, or better, sharpness than an f/2.8 F-lens would give you at f/4. If you look at it the opposite way, an f/4 F-lens would not be nearly as sharp as an f/4 Z-lens at f/4. One thing that mostly gets lost in this discussion around the web is that the “new” short flange distances are really an instance of back to the future. Recall rangefinder cameras have always had short flange distances, and wideangle RF lenses tend to protrude back into the camera body quite a bit (old Nikkor lenses come to mind here – they even made SLR wideangle lenses that you had to use with the mirror locked up all the time). The big, bulky, modern retrofocus wideangle lenses we’re used to seeing now were a reaction to SLRs with long flange distances. Nikon might have even been thinking of preventing too much rear-element protrusion, so they can keep the rear elements of Z lenses mostly protected by the lens flange. There’s nothing stopping anybody from making a mirrorless lens with the rear element as far back as it can go without hitting the shutter, but then it would be vulnerable to handling accidents. Canon reportedly went with a longer flange distance for a stronger camera body but at the risk of having more exposed lens elements in some bleeding-edge designs they might try. Nikon went with a slimmer camera body, and as Nasim said, it shouldn’t matter much – you don’t want to hang a big lens off of a little body, you hang the little body off of the big lens. Peter, that’s a great point, thanks for adding! Hi, I was about to comment that camera makers can make the lenses to protrude back into the body to compensate for those few mm difference in Flange distances. Canon is known for their APS-C lenses that have rear element goes into the body far enough to be in the way of the mirror going up. And also Canon, in their presentation for the EOS R announcement, did mention that they will have short “back focus distance”, and that it is different from flange distance. That means they are going to do the same with their APS-C lenses design. I’m with Nikon for the “less room in the body, more room in the lenses” argument, as I think it helps with slimmer body, and more room to use for lenses. In the same sense, Nasim, I think your calculation for Angle of Incidence doesn’t have much meaning, because it will come down to the size of the rear element, which is different from lenses to lenses, and “back focus distance”, which is not only different between lenses, but also varies when a lenses does focusing. How are the z7 and z6 selling so far? Is the demand high at all? From what I have heard, the cameras are selling extremely well. The Z6 is a bit delayed for a November release, but lots of people want to use that for video (myself included). Could you explain that now since Nikon has the most (theoretically) potential of all mounts, which is the smallest f/ a lens can we expect in the future? Eg is the f0.95 the smallest? Even if Nikon has bigger throat than Canon R, does this means that Canon cannot produce a 0.95 lens at least in the same league as Nikon is expected? (I dought). For instance, Canon EF managed to support an AF 50 f1.0 while Nikon F could not. Can we expect something similar from Nikon side now? Can we assume also the the larger diameter of the mount is more protected to higher torque strengths on it? I mean, a higher diameter means that the mount has less probability to suffer from decentering? As for the higher torque question, that’s all debatable, but I do know that Nikon has gone with 4 tabs to have as little play as possible to prevent any sort of alignment problems. Even a very slight deviation can result in soft parts of the frame on a high resolution camera. I would like to see the data for µ-4/3 as well. The reason for that is the rumours the Panasonic is going to release a FF system using the Leica L mount. And there is talk about an adapter for µ-4/3 lenses. Is that physically possible? Also, is it really something one would want? Tom, you cannot mount Micro Four Thirds lenses on a full-frame system – half of the image is going to be black due to image circle not being wide enough to cover full-frame sensor. So no, you would never want to do that. Thanks for letting me know – it was a typo, and it has been fixed. The angle has been updated as well. I wish they all have the same mount like some M3/4 cameras (Olympus, Panasonic and Kodak). I also use some old lenses on my D610, the EA3 adapter on Sony A7RII. I use old lenses on my Olympus E 10 M2 with adapters for Pentax, Minolta MD, Canon FD and Vöigtlander QBM . I need no more mounts. Although they are meant to be extremely sharp, the new F1.8 lenses for Nikon Zs (35mm & 50mm) are longer than their F-mount equivalent lenses by 12mm and 30mm respectively, and around 100g heavier. Does the short flange distance mean all lenses have to be longer, or will it be possible for a pancake style lens to be made for the Zs? I have a number of old Nikon lenses from my film photo days (bayonet mounts) – and an old nikon body which I want to replace with digital. My lenses are lovely, and I would like to use them on a digital camera body but I want to make sure that is possible. I have read all these posts with some excitement and was hoping you might have some guidance for me, advice as to which digital camera would be appropriate, or perhaps what to look for in a camera body?